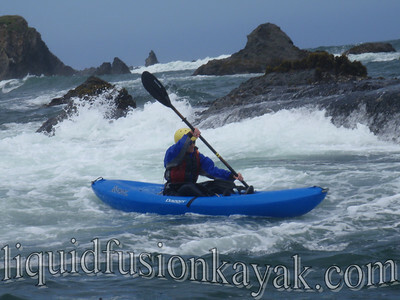 Liquid Fusion Kayaking: Wet & Wild - Mendocino Coast Kayaking ROCKS!!! Some call it rock gardening or extreme ocean kayaking . . . we call it FUN!!! 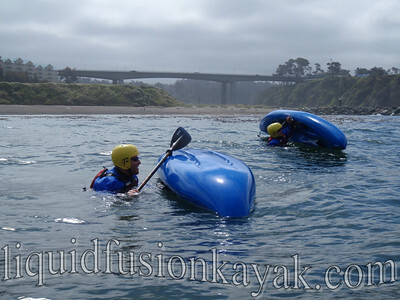 This weekend we had a blast sharing our Mendocino Coast kayaking playground with guests from all over the country. 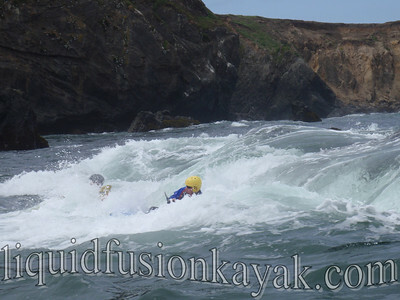 Wind swells created lots of whitewater for us to play on in our whitewater kayaks. 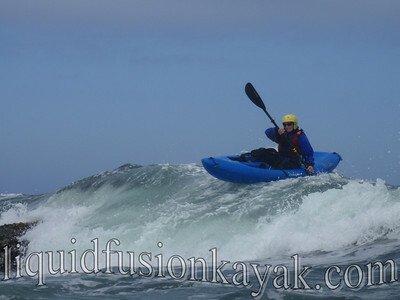 We are really stoked with our new whitewater sit on top kayaks - Dagger Torrents. They are super stable yet very maneuverable and perfect for beginners. 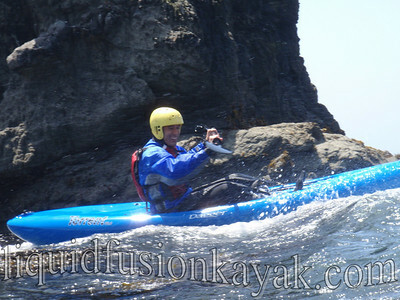 Many of our guests were first time kayakers or had kayaked just a few times. We started each session with a kayaking lesson that included basic paddling and safety skills including capsize and recovery. One of our paddlers made up the funniest scenario/story as he paddled and capsized - unfortunately I didn't catch it on video. After some skill work, we started to play - starting small and then going BIG!!! It is fun that each feature that we play on has different options depending upon the paddler's comfort level. And it is just as fun to sit and watch (or take photos as I did) as it is to ride the waves. Facial expressions are priceless. As we played in the rock gardens, we were treated to displays of the brown pelicans flying north, osprey hunting for fish, sea lions cruising about, harbor seals checking us out, and other coastal birds (I am refraining from getting too birdy here). The sun was shining and the water was wet, wild, and refreshing. Ahhh . . . life is good.